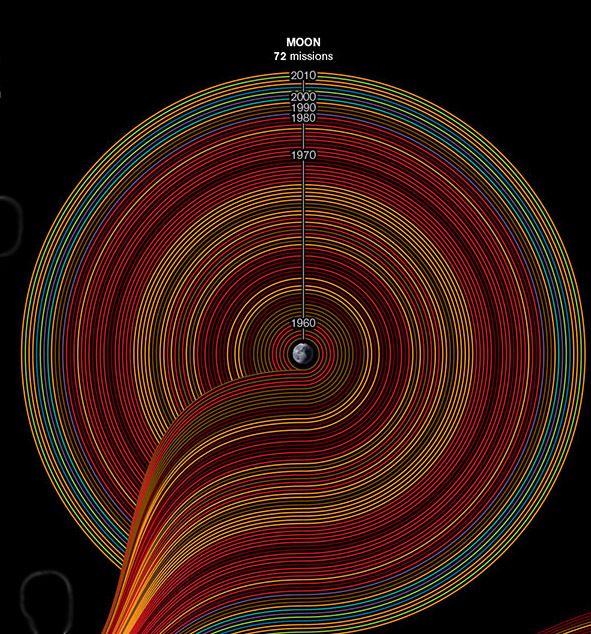 National Geographic asked 5W Infographics to update its 50 Years of Exploration graphic, a classic that I use often in my talks to illustrate our space exploration program and its focus on the inner part of the solar system. The updated version, renamed “Cosmic Journey“, is spectacular, better organized and easier to follow than its predecessor. It has been updated to include new missions sent over the past 4 years. The new color code includes the paths of failed, as well as successful, missions and also the nation that led them. Cosmic Journey by Sean McNaughton, Samuel Velasco, 5W Infographics, Matthew Twombly and Jane Vessels, NGM staff, Amanda Hobbs. If you are a fan of space exploration, I strongly recommend that you take the time to explore this map in high resolution. The history of space exploration is still in its infancy, we are not yet the master of this technology, so we have had many difficult moments that we call today “failures”. 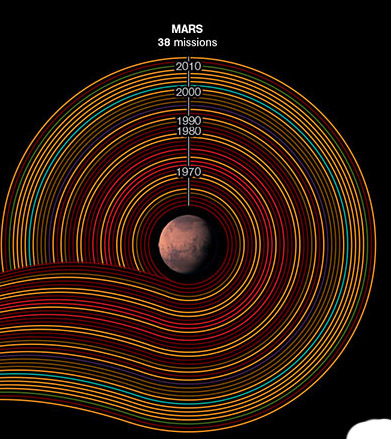 For instance, almost forty missions were launched to explore Mars but fewer than half of them succeeded in reaching the planet and returning useful data. Most successful ones were led by NASA and ESA. Unfortunately, statistic show that Mars is a doomed place for probes from the Soviet/Russian space agency. The recent diversity of colors around the Moon illustrates quite well that Earth’s satellite is becoming the new “place-to-be” for newest space-faring nations. Dominations of Russian and American (red and orange orbits) before 1990s is being replaced by a more colorful set of orbits which includes missions from the lunar exploration programs of Japan, China and India. 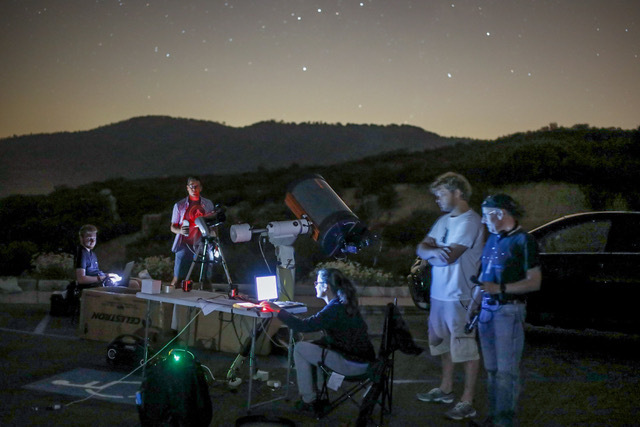 Thanks to the eyes of distant robots, we have also been taking pictures of far-off bodies like Jupiter, Saturn , Uranus and Neptune, or the outer solar system. And our quest is not over- NASA’s New Horizons, on its way to the dwarf planet Pluto, will flyby that multiple system quite soon on July 15 2015. ESA is already preparing a new mission, called JUICE, to explore Ganymede, a satellite of Jupiter. We have to be patient because this spacecraft will finally enter orbit around Ganymede in 2032. For sake of completeness, I should mention that NASA is also preparing the next mission to explore Europa (e.g. Europa Clipper), with the goal of better understanding the composition and activity of its ocean. 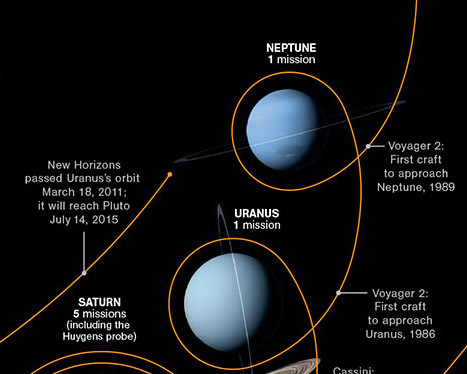 The bottom of the diagram shows the relative positions of these deep space missions, including Voyager 1, which recently reached the interstellar space. Pioneer 10 & 11 are not too far away, but have both been shut down. Voyager 1 is the robot, or controllable human-made spacecraft, located farthest from our home planet. The only downside to this spectacular map is the absence of orbits around minor bodies. Samuel Velasco, one of its creators, told me me that missions to asteroids and comets were not included because the graphic was getting too difficult to read. Tough choices had to be made. Enjoy the map. Thanks 5Wgraphics and National Geographic for making such a beautiful illustration available to us. Is this availabe and possible to buy as a pic or a poster, and if so where can i get it? This is a great illustration. We home school out two girls and wonder how we could get a copy of it for your Science class. i was an operative for the Defense Intelligence Agency, in the 1990’s. 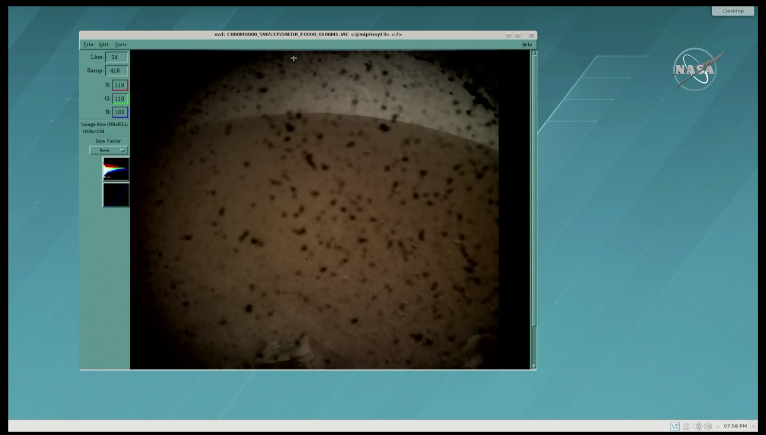 These missions are the open source missions and the NASA public missions. There have been many cover missions probes and lander to the same planets. These are the Clandestine missions from Navy Space Command and others. There were a few more Apollo missions that were DOD at least 3, There have been more landings on the moon by probes & rovers, same with Mars and Venus. there has been landings on a few of Jupiter moons as well. these undisclosed missions were not highly classified but their findings were. I know of the missions fact but i dont know the findings and curious to why these clandestine space missions were kept so secret to this day. 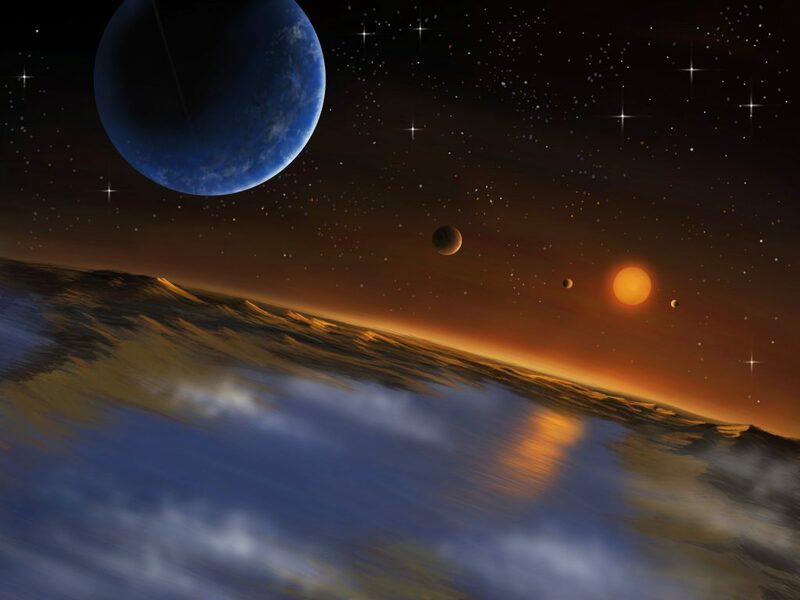 The kepler missions today and the Goldilocks planets are not all they are cracked up to be. The Kepler alone isnt totally responsible other programs are that are secret. Including signals intelligence long range outer space on secret frequency that SETI doesnt even know of. In the 90’s NSA would jam and screw SETI over in detection at times but again i dont know why this was selective. Amy long term SETI folks know this. These clandestine missions were number 1 a threat analysis why they kept secret as paranoid as it sounds they wanted to see if there was any kind of threat from Mars and Venus or the couple moons to the Earth. NSF – NSC – NCA over saw investigated. They branched out to Jupiter and the moons, that is where my service was done so i have no more information. The threats they were looking for were a alien threat direct or indirectly, alien technology, or some natural phenomenon in and around MArs – Venus – or Jupiter that could happen and effect the Earth. Clearly they did not find any but anything they did find or data is very classified. We pay for these programs and the time for secrecy has past its ok to release this information. They need to release also that they have 3-4 different type of Space planes operating since the 1970’s. SOme are single stage to orbit and others are shuttled up. How many space planes we operate now i dont know. They are not so advanced technology and these Navy SPace Command Aero-Space Planes should be disclosed to the public. No reason to keep it secret. Please tell us all when these Apollo missions launched, and from which pad. You can’t keep an Apollo launch a secret… even today, classified payload launches are seen by everyone. That space/time map is absolutely stunning, its now my desktop image. What a cruise eh. Thank you for posting. I would love to order a large poster of this for my classroom! How do I do it? Still should have included Dawn. Pluto and Ceres are both Dwarf Planets. Including one and not the other is a bit odd. I understand not including every trip to asteroids, but Dawn is more than that. Does anyone know if this updated version of the poster is available for purchase anywhere — perhaps even in a back issue of the magazine? I have tried contacting 5W Infographics, but they never responded. You post that the image has been updated yet only show the old image. The new one has 40 mars missions, your picture has 38. Why wouldn’t you post the new one?